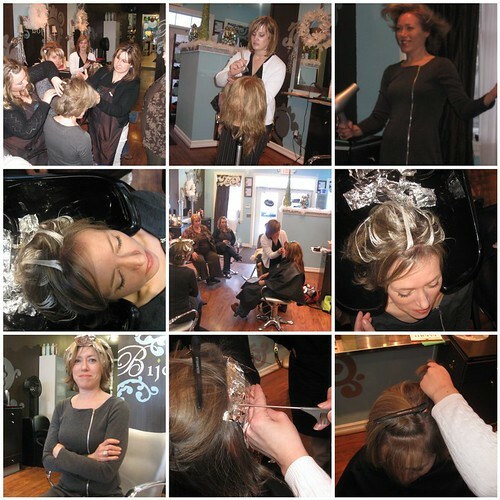 Bijou - A gem of a little salon in Skaneateles: In salon color class..what we learn! In salon color class..what we learn! What we learned from Jaime who is the master color educator for Lanza Healing color, (omg, they have a blog!!) was a really awesome ribboning technique done with foils, we learned 40+ new shade formula's, with names such as sandstone, teak, Cheyenne, mocha and so many more! We are all so excited to start using these colors, our hands are just itching! We always learn so much when she comes in! On Sunday evening, we have another educator coming in from Eufora, their cuts always impress me and I can't wait to see what they have in store for us this time! It's hands on, so we'll have manikins to work on, fun fun fun! !